I wasn’t sure how much I would use a dehydrator, so I first borrowed one from a friend. It turns out I had that thing running day in and day out, so I quickly purchased my own. I like the Excalibur (buy here) because the large square trays are easy to arrange any shaped food on, the trays remove to culture yogurt, and the temperature dial allows you to choose the temperature you want. 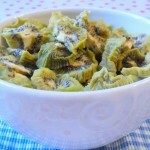 I wanted to share with you 20 different recipes you can do in a dehydrator. I’m sure you can think of others as well! Apricot Coconut Cookies is our favorite summertime cookie recipe. Homemade RX Bars are a delightful easy-to-digest alternative to the much-loved bar available in many grocery stores. 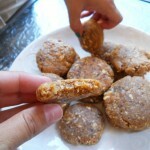 They use hypoallergenic collagen protein, dates, and are made in just minutes. Easy 10-minute mushroom chips beautifully take on any flavor combination you can dream up, and are a simple grain-free chip alternative to scoop up your favorite dip. Dehydrated strawberries are a favorite for everyone. Their bright color, sweet taste,a nd how it makes the entire house smell like strawberry fields as they dry makes this simple recipe a winner. See the recipe here. To be honest, the most common thing in my dehydrator is yogurt! Yes, you can use quart jars in the 5-tray Excalibur. Learn more here. Dehydrated Kiwi is nature’s sweet and sour gummy candy, cut into thick slices and then quartered, these are chewy and delicious! No-Fry Butternut Squash Chips are GAPS friendly and perfect for scooping up delicious dip! 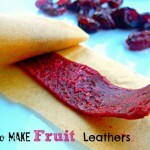 DIY Natural Shares How To Make Fruit Leathers! What Child wouldn’t love to have this in their lunchbox? 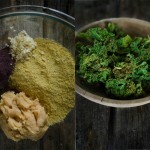 Green Veggie Powder from Nourished Kitchen makes use of the high quantities of greens that sometimes arrive in a CSA box. 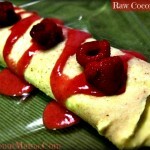 Raw Coconut Wraps are a must-try from The Coconut Mama! 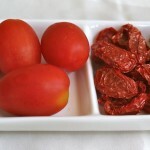 Real Food Forager preserves the deliciousness of summer tomatoes in her dehydrator. Mama and Baby Love cultures her fruit before dehydrating into leathers to sneak in some probiotics into a sweet treat. 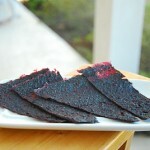 Jerky is much less expensive and easy to make from a roast! See here. And see here for jerky from ground beef. 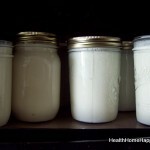 Small Footprint Family makes beautiful Coconut Yogurt in theirs. 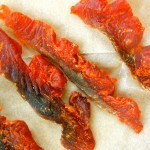 Salmon Jerky? 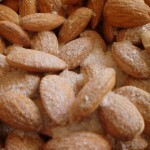 My Gutsy shows you how to make this protein rich snack! 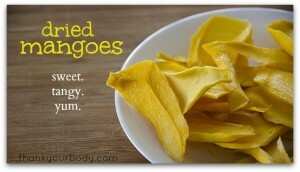 Dried Pears are my favorite dried fruit, and they make use of all the pears that are ripe all at once! I can’t wait for pear season! 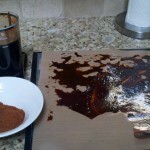 Homemade Mommy travels with bone broth by dehydrating it first! 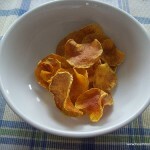 Kitchen Stewardship shows you how to dehydrate all sorts of vegetables into salty crunchy snacks! Crispy Almonds have been soaked in a salt brine and then dehydrated for easier digestion and they’re buttery delicious with just the right amount of salt as well! 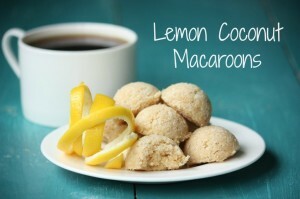 Mommypotamus makes Raw Lemon Coconut Macaroons in her dehydrator! 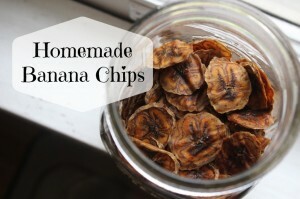 Homemade Banana Chips at The Polivka Family are my favorite movie-watching snack! Excalibur dehydrators are my favorite – their square shape is easy to store, and the removable trays make the dehydrator suitable for things like yogurt as well as dried fruits and veggies. Click here and read the reviews – I’m not the only one who loves their Excalibur! I’ve been thinking about a dehydrator for several years… These things take time, and I live in very small space, so I have to keep in mind where it will reside once in my home. Question is: how long do all these wonderful foods keep once dehydrated? My kids are long gone, so I wonder about the realistic value, unless I start feeding the neighbors, friends and colleagues. Once dehydrated, the food stored properly will last for years. 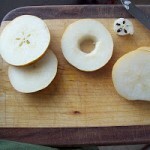 I have been thinking to get a dehydrator, but where to buy and how much does it cost? I live in Kuala Lumpur, Malaysia. This is fantastic! We will be putting together some of those lemon coconut macaroons today! 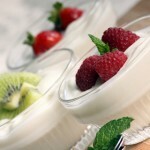 And that recipe for coconut milk yogurt is probably the best I’ve ever seen. Thanks! I would love to know where the cheapest place to buy the Excaliber is! I have been wanting one for years, and still have an old other name brand dehydrator. It works okay, but has the round trays that stack. Any good info on the cost? Honestly, I bought mine from Excaliber. They have an easy layway plan, and they were very friendly to deal with. I’ve never seen much price difference on these, across the internet. 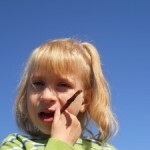 E-Bay, Craigslist or Estate Sale. I found my 9 Tray at an estate sale for $40 (I saw it in one of the online pictures at estatesales.net and was there VERY early to make sure it was mine) it needed a little clean up but works great. They come in colors now which is really nice. Thankfully I found one at a resale shop for $5.!! Dehydrated products, stored (ideally) in glass containers, out of sunlight, dehydrated at not more than 118oF-although 98oF is ideal- maintain most of the nutrition for up to a year. Sealed airtight and stored in a freezer, they are good for up to three (3) years. You can also store them in heavy-duty plastic bags – add a packet or two, depending on size -of Silica Gel, which you can purchase, to ensure the food doesn’t absorb moisture, & turn moldy. The Link for the Salmon Jerky is not working .. Thanks for great ideas!! Thanks for the great ideas. So far, I’ve mostly used ours for herbs and morels. I’m ready to try some new things. I’m confused. The picture at the top looks like ground beef which is labeled beef jerky. However, in the recipe, it says to use a roast. Can you clarify? Thanks! 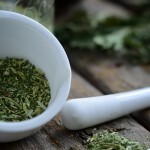 Has anyone tried dehydrating organ meats, pulverizing in a food processor and encapsulating? It sounds like a great way to consume organ meat without having to eat it. Does anyone see a problem with this? Thinking about trying it this week. angela, let us know how your experiment with organ meat goes .. i’d really like to know. thanks ! I have been thinking about buying a dehydrator for ages but I can’t decide which size excaliber to get. Are you happy with the 5 tray? I worry that it won’t be big enough but since I live in an apartment I think the 9 tray might take up too much space in my small kitchen. I would always suggest going with the largest number of trays. I have a Nesco/American Harvest and I think I’m up to 15 trays now. The more the merrier, especially if you’re doing garden crops or found a great deal on fruit/veggies/meat. 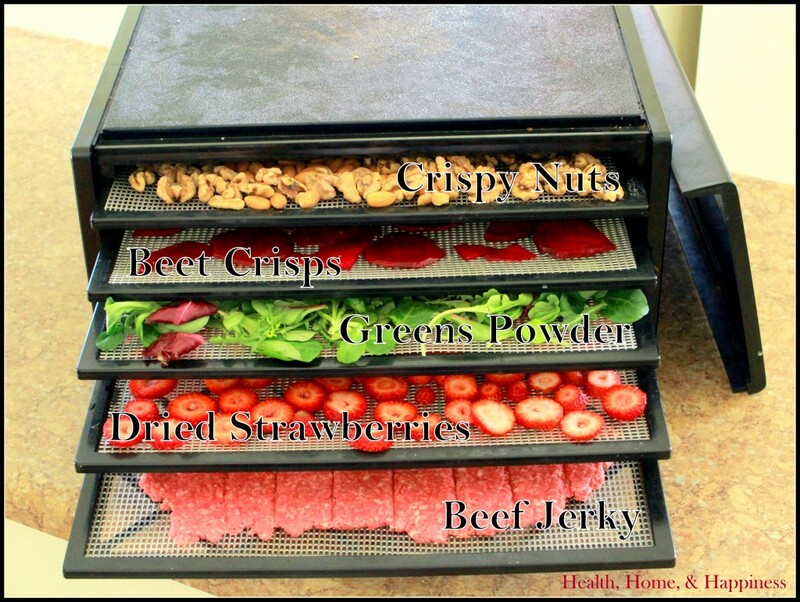 Cara, do you/can you actually dehydrate these things together…the nuts, beets, greens, strawberries and jerky? You can only do things together if they all need the same temperature/humidity levels. Jerky needs a really high temp (to keep the bacterial growth at bay) whereas herbs/greens need a really low temp so they don’t get baked. 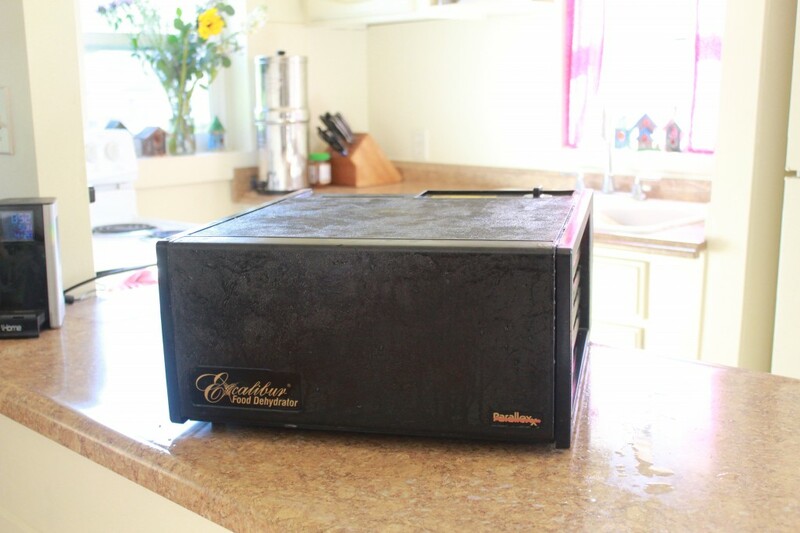 I have had an Excalibur dehydrator for a number of years and love it. I wouldn’t trade it for anything. 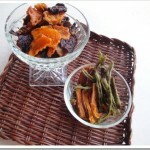 One of our favorites is homemade raisins and dried strawberries. I slice the grapes in half before I dry them because they dry faster. The strawberries I cut in slices. I’m looking forward to trying out the ideas you have posted! I bought my 9 tray Excaliber used for $42.50 from an ad in a local freebee paper. If it ever quit I would definitely get another. I also have an American Harvest which was my first dehydrator. I used it for years until I found my Excaliber. I like the Excaliber better because you can get larger things in by leaving out trays. With the American Harvest round tray, the trays stack on top of each other which limits the size of things you can put in (like the yogurt cups). I make a lot of jerky during deer season and even when I make a huge batch, I rarely fill up all nine trays. I love doing watermelon and cantalope in mine! Also blackberry leaves for tea and rose hips, cherries and grapes. pineapples are a family favorite! I made my own! Back when I was Paleo I decided to try the pattern that I found on the web using cardboard box .Halfway into the construction I realized that it was way too flimsy. I still used the same schematics but designed my own with my husband’s help & my mom’s help, I turned the raw materials into a beautiful dehydrator and jerky maker. Removable trays, binder clips for jerky, a CPU fan for circulation (but NOT for the jerky. I learned this very quickly!). I just need money for decent groceries and this gave me inspiration from when that happens thank you! I don’t want to discourage anyone away from the model mentioned here, but keep in mind the new cuisinarts crock pots. In mine, I dehydrate, sous vide (some proteins, not all) and deep fry. You can also brown in it as temperatures range from 125 degrees to 450, in 25 degree increments. In terms of versatility, it’s truly amazing. I have a dehydrator but haven’t used it much. I’m thinking of using it to make snacks for my 1-year-old but the finished product would have to be soft and easy for a 1-year-old to eat, not tough or chewy. What would be the best fruits and vegetables for this purpose? I guess I could figure it out myself by trial and error, but I’d hate to waste time and money if someone here already knows the answer. I make a lot of dehydrated dog treats for our two dogs. They are a lot cheaper than the stuff in the big box stores! What we make does not have any of those preservatives and other questionable things. One of the local big box stores carries thinly sliced meats, so all the hard work is already done! If you make kombucha, the scobies which multiply like bunnies can be turned into vegan “beef” jerry using a simple marinade and a dehydrator. I need to try that! Great idea!